Posted on Fri, May 6, 2011 : 12:34 p.m.
DTE Energy is stopping the flow of subsidies that helped offset the cost of installing solar panels at Michigan homes and businesses. The owner of one Ann Arbor area solar panel installer, Sunventrix LLC, said that DTE's decision to end subsidies for new photovoltaic installations will result in fewer jobs for solar panel installers, electrical workers and contractors. 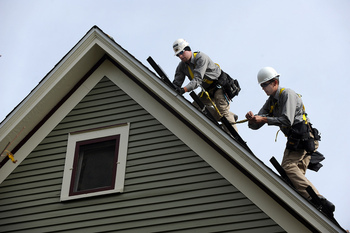 Workers from Canton-based Mechanical Energy Systems install solar panels at a home on Ann Arbor's Old West Side in October. Mark Hildebrandt, owner of Sunventrix, said that 100 percent of his photovoltaic installation customers — residents and businesses — applied for subsidies from DTE's SolarCurrents program. "The sad part is that it created so many jobs in Michigan," Hildebrandt said. "This is all going to change quite dramatically because every installer who was working with this program had lots of opportunities to sell solar. "Sure, there will be people who are doing it for environmental reasons and they just want to do it to feel good, etc. But the financial reason is not as good as it used to be." DTE said in a news release this morning that it would end the SolarCurrents subsidies for new residential and commercial customers. Customers that already have installed panels and received subsidies or filed applications by Wednesday will continue to receive them. The decision is also sure to boost the cost of installing solar panels. When DTE launched the SolarCurrents program in September 2009, it said that the subsidies would reduce the cost of installing solar panels by "50 percent or more." The Detroit-based utility said today it had hit the 5-megawatt goal for solar installations, a target set when the company launched the SolarCurrents program. DTE spent about $25 million on incentives to help customers do about 500 installations. "The SolarCurrents program demonstrated that financial incentives can spur significant growth and interest in an emerging renewable technology," said Trevor Lauer, DTE Energy's vice president of marketing and renewables," in a statement. "We are proud of the role this program has played in helping Michigan's solar industry transition to become a viable and growing industry within our state." DTE spokesman Scott Simons, in an interview, acknowledged that the end of the subsidies "could have some kind of impact" on solar panel installers. "But we’re pretty confident that people will be continue to be interested in installing solar panels even without the incentives," he said. "This was a way for the industry to have a little jump start. We feel that that’s been accomplished." As part of the SolarCurrents program, DTE offered upfront payments to customers who installed solar panels at their homes or businesses. It also offered additional subsidies over the course of the next 20 years based on the power generating capacity of the system — and those subsidies will continue for existing customers. Customers with solar panels are still eligible to participate in the state's net metering program, which allows owners to sell excess renewable electricity back to utilities. And new customers are still eligible for the federal government's tax credit for new solar panel installations. But Hildebrandt said he's concerned that prospective customers will be turned off by DTE's decision to drop the subsidies. "The unfortunate side of things was that the people you were just starting to talk with were really excited about it," Hildebrandt said. "A lot of people were interested in this." Hildebrandt said he was particularly disappointed because he didn't expect the SolarCurrents program's 5-megawatt cap to expire for several years. "Everyone was expecting it to last longer and all of a sudden, pow, it's gone," he said. "It was such a wonderful program." DTE said it plans to continue the SolarCurrents program for utility-owned solar panel installations, a segment that's capped at 15 megawatts. Altogether, the 20 megawatts of power DTE is subsidizing through the SolarCurrents program will help the utility meet Michigan's Renewable Portfolio Standard, which requires that utilities get 10 percent of their electricity from renewable sources by 2015. DTE needs to generate about 1,200 megawatts of renewable power, most of which will come from wind turbines. In Ann Arbor, several businesses and residents have taken advantage of the program. Ann Arbor-based real estate firm McKinley Inc. and search engine giant Google are collaborating to install a 20kwh system on the top of the McKinley Towne Centre in downtown Ann Arbor. Sunventrix, which uses subcontractors to handle the sporadic nature of the solar panel installation industry, is installing the McKinley Towne Centre's photovoltaic system. That system is among the last installations that will qualify for the SolarCurrents subsidies. "I don't think DTE understands the impact of this program from a goodwill perspective but also from a revenue perspective and all the job creation," Hildebrandt said. A representative from the Michigan Public Service Commission could not be immediately reached for comment. Mon, May 9, 2011 : 1:32 a.m.
Now all has been revealed. Thank you for giving us a glimpse of what we are dealing with. Sunshine is the best disinfectant. All the anger and distortion in the world will not change that fact. Tue, May 10, 2011 : 1:45 a.m.
Sure thing....just keep that foil hat on good and tight. Sun, May 8, 2011 : 2:42 p.m.
"…Republicans are not looking out for the little guy,&quot; ..perhaps one of the greatest lies of our time. Democrats ran Detroit for decades – how is that going? Is the "little guy" doing pretty well? If the "little guy" wants to work and raise a family, it's hard to see how democrat eco fantasies and job/vote buying schemes that could cost him basically a car payment every month in inflated energy costs are in his interests. Add those businesses who refuse to pay and leave the state as a result and it's hard to see who's happy except radical eco hysterics who think they control the earth's weather with the money they waste. Sun, May 8, 2011 : 2:34 p.m.
Sun, May 8, 2011 : 3:50 a.m.
shepard145, so your point is, what? Nothing is better? I've had solar and it works great, saves money, and harms no one. Why are you so opposed to NOT harming the environment? Or critical of those whose try to make a difference? Tue, May 10, 2011 : 10:29 p.m.
Mercury and &quot;soot&quot; poisoning from coal fired power plants? LOL! And what comic book did you get this gibberish from? That is utter nonsense just like the claims of acid rain. It is true that powering the worlds only super power, a nation that produces more then 25% of the world's GNP with only 4.3%of the earth's people (pre-Obama), there are going to be some &quot;marks on the pristine land&quot;. No question and we accept that as a price for PROGRESS and OUR HIGH STANDARD OF LIVING (pre-Obama). But that does not excuse all the eco liars out there. It's too bad energy companies can't go after them for slander and force them to try to prove some of this nonsense or PAY UP. Tue, May 10, 2011 : 3:54 p.m.
Yup, the market served us well when pollution from coal power plants trashed our air with soot, water with mercury and destroyed untold number of acres of West Virginia wilderness, lost to mountaintop removal mining methods. Sorry, the majority of people don't want to live in the world that you would have us live where companies are allowed to destroy our environment at no cost to themselves and at great cost to everyone else. Sun, May 8, 2011 : 3:09 p.m. When talking about state and federal energy policy and it's impact on the economy, your experience with solar is not relevant and your judgment that it saves money questionable. More likely you enjoyed subsidies paid by other Americans as politicians rewarded you for adoption their eco fantasy. My point is that you are not making any difference. The earth's temperature will remain the same whether you and others have solar panels or not. This is about clarity of policy. If our tax dollars are to be spent for a purpose, that purpose must be REAL. THE ENTIRE BASIS FOR THE EXISTANCE OF GREEN ENERGY IS A LIE. The reason it matters is because Michigan's economy must compete nationally and globally with other economies and the more we pay for energy and everything else, the less competitive we are, the worse the economy becomes and the fewer jobs we have – not just now but for DECADES. Nothing is better? A real question!! What is better is dictated by authentic market driven solutions. In 130 or more years as oil becomes less economical, the world economy will create phased solutions as the problem emerges. …but today, we're fine unless problems are created via bogus regulation, etc.. Our arrogant politicians and eco hysterics seem determined to create artificial climate crisis as well as an artificial solutions and make us and future generations pay for them!! THAT IS UNACCEPTABLE. In the mean time, using more efficient appliances and systems is fine – just don't pay more then the energy savings is worth. ….in that context, the VOLT is doomed to fail for now…. Sun, May 8, 2011 : 12:26 a.m.
Republicans are torpedoing the state's incentives for conservation and renewable power with bogus comments and legislation. Supporters of renewable-power and conservation incentives say the move to undermine them is not only illogical but hypocritical. For while Republicans say it's unfair and costly for the government to encourage alternative power, they seem fine with subsidies, tax breaks and government spending that help oil, coal and other fossil fuels. "They don't mind incentives for big corporations, but if you talk about incentives for consumers or small businesses, they seem to be opposed to those," she says. "This Legislature is not interested in encouraging renewables or helping consumers lower their bill through increased conservation." Schweitzer, a self-professed including renewable power, also says killing conservation and renewable-power incentives will cost jobs, by discouraging development in these areas. Several bills have either passed the Senate or moved to the Senate floor, on party-line votes with Republicans in favor. Democrats who support renewable-power laws bristle at the claim that subsidies and mandates give wind or other alternative sources an unfair edge. Rep. Mike Phillips, D-Bozeman, says if consumers had to pay the "real" cost of gasoline or coal, such as their environmental impacts or defense costs to protect international oil shipping lanes, those types of energy would be much more expensive. Republicans are not looking out for the little guy," "They are only looking out for the power industry of the past. They are trying to make everyone dependent on fossil fuel instead of becoming independent of it. "It is a different direction than the rest of the world is going. It's like, wow, would you please climb out of the 1950s?" Sat, May 7, 2011 : 6:33 p.m. I just want my energy bills to reflect the energy I use. I prefer not to pay higher rates for &quot;DTE goodwill&quot;, &quot;green job creation&quot;, or Google solar panels. Sat, May 7, 2011 : 4:29 p.m. COLD FUSION is the answer to stopping wars for oil and the AGW scam. The E-Cat is in operation in 97 locations in 4 countries and a 1 Megawatt system to go on line this year in the US. This is a game changer. Unless certain interests are successful in stifling it. Cold fusion isn't as difficult as we are led to believe. Google &quot;E-Cat&quot; or Andrea Rossi. Sat, May 7, 2011 : 4:34 p.m. Estimated cost to produce 1 Kw with the E-Cat $.01. Sat, May 7, 2011 : 12:24 p.m. Without commenting on the economics of solar, it would have been nice if DTE providedore notice of the program ending, like 30 days. Clearly, they did only what they had to, period. Sat, May 7, 2011 : 11:40 a.m.
No business case... so the harsh reality of $$ versus dreams occurs again. Sat, May 7, 2011 : 9:16 a.m. If you need to rely on a subsidy or tax credit to justify the investment then it really is not competitive technology. Sat, May 7, 2011 : 1:37 a.m.
PART 2: Those who value business and jobs, better wake up. The artificial "Green energy" forces over priced power into our state economy, making Michigan an even less economical place to live and work. Think of it as a very high energy tax. DTE is happy to create these embarrassing programs to keep delusional lawyer democrat governors happy because they have an agreement with the state that gives them an 11% profit weather they provide competitive energy or use uneconomical "green energy". Like the E85 disaster on a national basis, politicians would be wise to listen to industry experts who work and prosper in the real world rather then the democrat's favorite sources of information - academic eco activists and ridiculous eco lawyers. The answer is to kick the eco nuts to the curb and use the most economical coal and nuclear power available to power Michigan, making us as competitive as possible nationally and globally. The rest is toes in the grass gibberish. Sun, May 8, 2011 : 3:15 a.m. Sat, May 7, 2011 : 1:20 p.m.
John Q - I am not a supporter of coal as our primary source, but I would suggest you look into scrubbers, bag houses, and fluidized beds. Understand what those technologies do. Allowing existing plants to be as efficient as possible is the quickest way to reducing all emissions, since those plants are going to run anyway. An analogy would be to drive a car with one cylinder not working in the engine. You can get there, but your gas milage would be very poor. Fixing the cylinder would reduce your carbon footprint and your costs. Right now most coal fired plants are running with one or more cylinders not operating, because regulation has prevented them from increasing their efficiency. If you are going to use gasoline or coal or ... you should do it as efficiently as possible. Sat, May 7, 2011 : 12:52 p.m.
Yeaaa, and CO2 would matter if the US consumers controlled the earth's weather…..but they don't and never will. So considering that CO2 is errelevent and US Global competition matters a lot to those who live and work here, it's time to put the global warming fraud behind us an get to work on what matters. Coal plants will modernize and improve efficiency when crushing regulations are scrapped and the economics call for it. Enough Soviet style central planning of artificial markets by obama and his inexperience, ridiculous eco Tzars. The future of this country better be to dump job killing policies based on the global warming fraud and get back to work. ....or create a lost generation who pays dearly for the ignorance of this one. . Sat, May 7, 2011 : 3:29 a.m. I'll prefer my energy from sources that don't compromise my health. Feel free to live downwind from a coal-fired power plant and then let me know how wonderful it is for everyone. Sat, May 7, 2011 : 3:18 a.m. The easiest and quickest way to reduce CO2 production in the US would be to allow coal plants to upgrade their efficiency with a modification to the new source review. In many cases plants could make 5 to 15 percent more power on the same amount of coal. Energy Efficiency programs are also useful to the future of the country. Sat, May 7, 2011 : 1:36 a.m.
PART 1: DTE wanted to produce 5 MW of power with solar? LOL How much of that is the real number - usable line voltage? Either way, they're throwing a deck chair off the Titanic when a nuclear reactor produces 6,000 MW. Michigan gets 100 days of sun per year, one of the poorest in the nation. As it was in the 70's, solar energy today is tailor made for eco hysterics and the global warming hustling companies who feed on them. PV solar panels produce less power on cloudy days and even less when covered with snow or when over heated. Then over time their ability to generate power drops off – down about 20% in 15-20 years and continues to fall until they NEED REPLACEMENT. Figure that into your payback schedule! Notice "feel good" pieces like this never mention power drop off. They also don't tell you that what little power is generated does not go into your house as most people think – it goes to a meter, back into the grid and you benefit by off setting the power you use. …that is because if you're out on your own, you need a pile of lead-acid batteries, solar panels produce relatively little power compared to what the average home uses and they would be silly undependable as a line voltage source. You also need a switch so that during a power failure, your PV cells don't continue to feed power into the grid and electrocute the guys trying to fix it. ...I know, what a bummer right? Solar and wind power are bad for Michigan because there is no market for them. They are an illusion propped up by subsidies – government taking money from Michigan and United States utility and tax payers and diverting it to others for emotional rather then engineering reasons. The implicit assumption is that if you over pay sufficiently for power, the earth will get colder…..that is, as a consumer you control the earth's temperature. So the basis for the existence of "green energy" is an absolute lie. Sat, May 7, 2011 : 3:16 a.m.
Nuclear reactors produce between 600 and 1200 MW of power, depending on the reactor and how it has been retrofitted in the US. New EPRs should be able to produce 2000 MW of power. Fri, May 6, 2011 : 11:15 p.m.
Fri, May 6, 2011 : 10:27 p.m.
Another fine example of someone in Michigan doing everything they can to keep Michigan out of the 21 Century. &quot;Fred Flintstone State&quot;. Fri, May 6, 2011 : 10:26 p.m.
Maybe if DTE would stop playing the charity to Detroit (jobs programs, music lessons, etc, etc) they could afford to bring this back and help reduce all the carbon they put into the air from their coal belching plants. Fri, May 6, 2011 : 9:15 p.m. Kudos to DTE for completing a mandated &quot;green&quot; program. I have never understood how they can integrate intermittent power such as wind or solar into an instantaneous-use power grid without dumping excess or keeping a spare generator on standby: double kudos. Sat, May 7, 2011 : 3:14 a.m.
Dog Guy - The system has what are called ancillary services, that include generators burning fuel but not making power, called rolling reserve. Typically for renewables, you have 1 Megawatt of rolling reserve for every 2 to 4 megawatts of variable renewables. Because voltage has some room to change up and down based on regulation, you have some time to be able to adjust the supply. Fri, May 6, 2011 : 7:45 p.m.
Um - so success with a program which originally was intended to increase interest in solar powering one's home or business is... a BAD thing?? Laughable. Overall, alternative energy technology shows promise and even some degree of success. We are NOT (according to experts) anywhere near finding a total replacement for fossil fuel electrical generation. We are still in a developing environment in that respect. Cars: started out with a score of manufacturers making cars propelled by kerosene, gasoline, electric batteries and steam engines. That all settled out with the emergence of gasoline fueled engines the winner: because petroleum as &quot;dirt cheap&quot; by comparison to the alternatives. Now - electric powered cars are making a comeback. And this evolved after roughly 100 years of development! Energy for home and business use has followed an analogous path. So it's reasonable to see this dynamic as natural. Anyway: we have here a situation where private businesses are complaining about the ending of what amounts to a public payout program. That's too common today: &quot;mighty&quot; private enterprise complaining about losing corporate welfare. Let them not then say that welfare for citizens is wrong. Sat, May 7, 2011 : 12:35 a.m.
Fri, May 6, 2011 : 7:43 p.m. The Solar panel systems works just fine here in Michigan. With the DTE program you could put a nice system on your home or business which produced a return of approximately 9% on your investment offesetting your electricitiy in full or partl. With the DTE Solar Current system it would take about 11 years or so to recoup your entire investment and then your home is still producing solar electricity. With a business and an IRS 179 expense the return in far quicker and much more dramatic. Additionally, if the program stayed in tact innovation would certainly both increased the efficiency of the systems and decreased the costs of the solar here in Michigan. Certainly, another strong benefit of Solar is that it decreases our dependance on dirty fuels such as coal. Michigan gets enough sun to make Solar installation a viable resource here in Michigan. In fact DTE continues to install its own large scale Solar systems here in Michigan even after they closed the Solar Current Program. It would be nice if the DTE Solar Currents program was continued for both the economy and the jobs created by this business as well as the environment and the citizens of the State of Michigan. Finally, the reason that the DTE Solar Currents program closed was not because of lack of sun in Michigan, but rather because the program was so successful., that the funds were exhausted almost 3 years ahead of schedule. Sat, May 7, 2011 : 2:56 a.m. It is 9 years not 11. It does not matter what size a system for the 9 percent return since installation per kwh is a fixed rate. We subsidize the coal industry and gas and oil industry. The difference here is that actual citizens of the State of Michigan were able to take advantage of this program. Some folks would rather have the subsidies all go to big oil, the coal industry, nuclear power, the financial bail out, the auto industry bail out. The list goes on and on. Germany is subsidizing their solar program to get it established until it take off on it own. That is nothing new. It is part of the American system. Everyone should have a 11 kwh system on their house which would generate enough power for all their electrical needs P.S. The 9 percent returns already factors in replacement of the microinverters at year 13. Opposition to the solar program is for Luddites and other backward thinkers. Sat, May 7, 2011 : 12:29 a.m.
&quot;With the DTE Solar Current system it would take about 11 years or so to recoup your entire investment and then your home is still producing solar electricity.&quot; two questions: Is that based on the 50% subsidy to install? What average electrical usage is that based on? Fri, May 6, 2011 : 7:51 p.m. Yes, that's the correct meaning of the DTE decision to end their subsidy. It's only the whiners who somehow predict doom from a successful program that we need to disregard. Fri, May 6, 2011 : 7:25 p.m.
Aargh. I just signed a contract to install a 20kw system on our house yesterday. This changes everything. Fri, May 6, 2011 : 8:36 p.m.
Fri, May 6, 2011 : 6:14 p.m. Sat, May 7, 2011 : 1:15 p.m.
John Q - Every form of energy conversion has an environmental impact. If you don't believe me, look at the lawsuits against almost every kind of energy source. From wind farms, to solar farms, to geothermal, to natural gas to .... Yes, coal can be mined in an environmentally unfriendly way. So I have a question for you on mercury, which puts more mercury in the environment each year - compact florescent bulbs or coal fired generation? Sat, May 7, 2011 : 3:28 a.m.
Are we going to pretend that allowing coal companies to pollute our environment at every point in the process has no cost? Blowing mountaintops off in W. Virginia? Mercury in our Great Lakes? How about all the people who get sick every year from the pollution from coal-fired plants? Sat, May 7, 2011 : 3:12 a.m. It depends on how far up the supply chain you want to go. I the case of coal, waterways and rails get federal money, but both also move food and other products. The US Economy is complex and one can argue that any source of energy is subsidized at some level. In direct subsidies and favorable rates, wind, solar and micro hydro all get more than others, but it would not be fair to compare just the direct subsidies. Sat, May 7, 2011 : 12:24 a.m.
&quot;What forms of energy aren't subsidized?&quot; Fair question. The non-answer is to what degree? A 50% subsidy is a bit steep. Not sustainable long term. Fri, May 6, 2011 : 7:10 p.m.
What forms of energy aren't subsidized? Fri, May 6, 2011 : 6:25 p.m. I might add that I'm not anti alternative energy. And i appreciate that many technological advances start with subsidy's. Fri, May 6, 2011 : 6:01 p.m.
Also, solar panels do generate electricity when it's cloudy. Just less than when it's sunny. Fri, May 6, 2011 : 5:59 p.m.
@John of Saline, There are ups and downs to installing solar panels in Michigan. There are fewer sunny days in Michigan than in places like Arizona, like you suggest. Thus, less sunlight for the solar panels to capture and convert to electricity. However, many people do not know that the sunlight-to-electricity conversion process in solar panels occurs more efficiently in cooler weather. That's one reason why Germany, which has a similar number of cloudy days as Michigan, is considered the world capital of solar power. Sat, May 7, 2011 : 3:09 a.m.
Nathan - You are aware that Germany terminated most of the subsidies for solar, I assume. Fri, May 6, 2011 : 5:53 p.m.
We're not exactly a sunny state. How many years would it take to generate power to offset the cost? I mean, in Arizona this kind of thing doubtless would make a lot of sense. But here? Fri, May 6, 2011 : 5:13 p.m. If the panels are going on top of conventional roofing the cost to remove and reinstall them to replace the roofing under them would be significant. A home owner should factor that in to the cost. Sat, May 7, 2011 : 6:39 p.m.
Maybe other costs/liabilities too; maintenance, appearance, resale, etc. Fri, May 6, 2011 : 5:04 p.m.
How do we push DTE to continue this program? They need to set a higher cap. Let's do another 5 MW, DTE! It's too bad because I was looking to push my parents into finally getting a PV installation. This puts a dent in my case to them. Fri, May 6, 2011 : 8:32 p.m.
Don't you have $50 million of your own money that you can plunk down to continue the program? Fri, May 6, 2011 : 7:59 p.m.
uh, thanks... what was the point of your comment exactly? I said I was &quot;looking&quot; to push them. I'm in a fact gathering stage still, and the removal of additional incentives is a bummer. Fri, May 6, 2011 : 7:47 p.m. If you can't persuade with the facts, then give up. If you continue to &quot;push&quot; someone and they end up unsatisfied: who do you think they'll blame?